Subsea Gauges – Good! Better! Best! 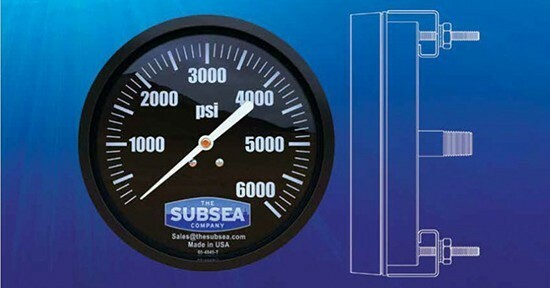 Subsea pressure gauges with ranges from negative 5000 to 20,000 psi are now standard product and readily available. These gauges are offered at three pricing values. Rugged and designed to offer superior corrosion resistance, Subsea Pressure Gauges provide excellent subsea performance with high quality internal stainless materials providing precise temperature and pressure compensation. Each Subsea Pressure Gauge has an advanced bourdon tube design and is manufactured for long-term, deep-water deployment. Subsea Gauges are designed to pass annual calibrations and recertification. The Zytel case provides superior corrosion and chemical resistance with a flexible structure that adds reliability to the internal breathing diaphragm for better depth compensation. The black face with white lettering on the gauge provides exceptional readability in low light conditions. The ultimate reliability and performance is achieved when you choose the “Subsea Certified” option. Subsea certification combines the value of calibration verification and proof of performance at subsea depths up to 10,000 feet.